No, not photoshopped, and (apparently) you can still see this happen at the right time of year. 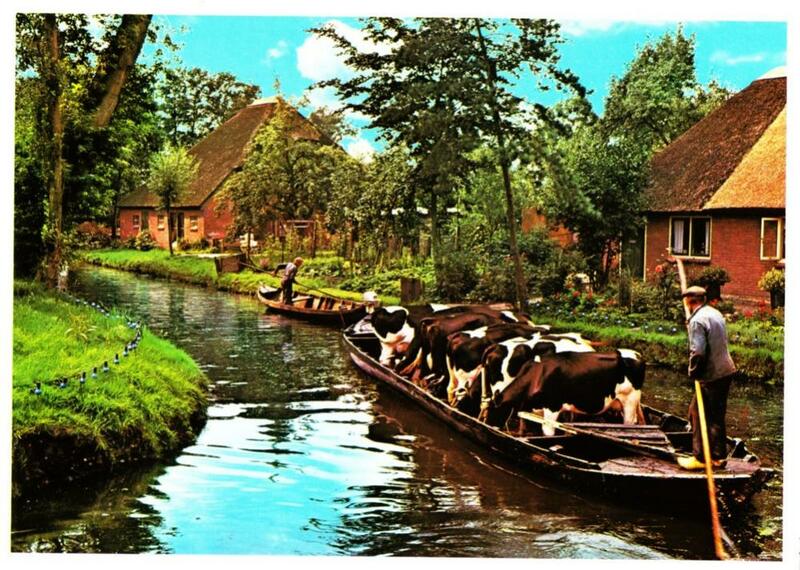 I bought this postcard in Giethoorn, a village in the Netherlands. In the old part of the village there are no roads, and all transport is by water. These cows are being taken from their winter barn to the summer fields, and the only way to get there is by boat. I can't imagine what it must be like trying to get a cow on the boat for the first time... but these cows look pretty cool with it. Last edited by Undertoad; 03-26-2009 at 07:52 PM. cool, sandy, thanks. I suspect they coat the boat with superglue immediately prior to loading the cows. OK, so we've got the meat and the liquid, all we need are a few veggies for a nice stew..... or it the guy in the hat about to skewer them all with that pole and make a delicious kebab fit for a giant? Cows, like most critters, will follow their food anywhere. Notice their all chowing down. However, I imagine the first trip or two with a calf or young heifer could be much more exciting. Hey, you don't suppose they're bait, do you? I want a boatful of cows! That reminds me of the Isle of Mann Ferry. Do they have a poop deck? They are being taken to feed the alien overlords. When those cows come home, Mom is gonna tan their hides for taking the boat. I misread this thread as Cows in Boots.